The most striking difference in Obama’s media narrative is the degree to which he has enjoyed considerably more positive press than either of his predecessors at the beginning of their first terms. Overall, positive stories outnumbered negative ones by better than two-to-one (42% to 20%). Another 38% were neutral or mixed. For both President Bush and President Clinton, by contrast, the bulk of the coverage was neutral, and negative coverage slightly outweighed positive. For President Bush in 2001, for instance, just 22% of the stories carried a clearly positive tone, nearly half that of Obama, while 28% were negative. 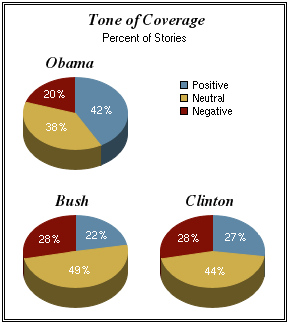 Roughly half of all Bush’s coverage was neutral. Eight years earlier, the tone of President Clinton’s coverage was just slightly more positive. In the same outlets during the same time period, 27% of stories were clearly favorable, while 28% were negative and 44% were neutral. There were also differences in the context in which the three presidents earned favorable notice. 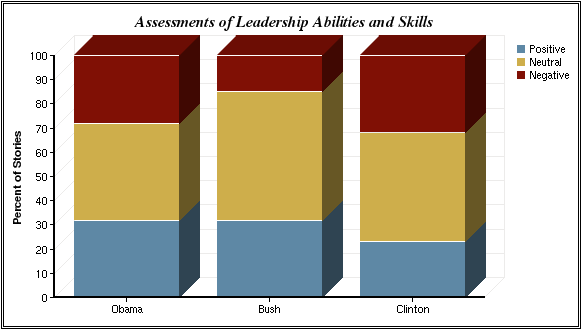 For Bush, his broad image as a skillful manager determinedly pursuing a conservative agenda scored him points on leadership but generated more negative coverage when it came to his ideology. Clinton’s early coverage created the image of a president connected to people but through often highly calculated actions that were designed to win him popularity. The calculated leadership style brought criticism while his policy assessments were more mixed. Obama, on the other hand, was praised on all fronts—policy, leadership and character. With the challenge of addressing both his own campaign agenda of change and that which history brought upon him—the economy—coverage boiled down to the broad question of whether he was succeeding. Whether assessed by his policy choices, leadership and personality, the answer was largely, ‘yes’. 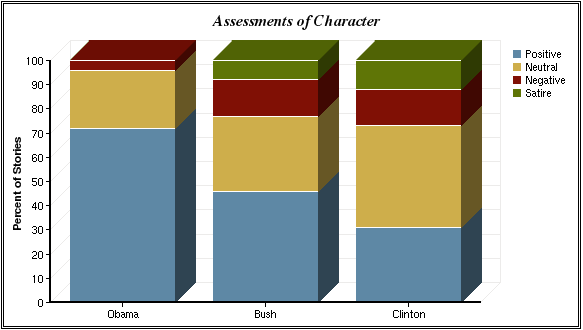 The most positive coverage—though it represented the smallest share—was focused on Obama’s character: his honesty, temperament and personality. Fully 72% of all stories here were positive in nature. That is far better than Clinton (31%). Yet it is even better than Bush, whom the press in these early days assessed quite favorably on character (46% positive and 15% negative). Obama also won the battle for coverage when it came to stories about his political agenda and ideology. These stories were nearly three times as positive as negative (46% versus 16% negative). 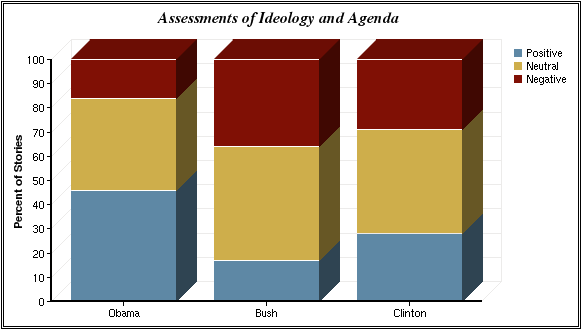 When it came to ideology and political agenda, Obama’s positive image again far outweighed Clinton’s (whose core ideology coverage was 28% positive and 28% negative) and even more so Bush’s (for whom only 17% of stories were positive while 36% were negative). Among the reasons for Bush’s problems when it came to ideology and agenda were his sometimes contradictory remarks, and questions, at times, about his grasp of details. A March 15, 2001 page one story at the Washington Post, for instance, read, "Bush appeared to send mixed signals about the U.S. economy. To reporters, he said he was concerned about the market turmoil but has ‘great faith in our economy.’ Later, in a speech, he declared: “Our economy is beginning to sputter.” Soon after Bush became much more guarded when the issue of the economy arose. But he also received harsh criticism for other policies like in gays in the military. Overall, positive evaluations of Obama on leadership slightly outweighed negative ones (32% to 28%), and most 40% were balanced or neutral. In contrast, Bush earned his highest praise here (32% positive vs. 14% negative) while Clinton earned his lowest marks (30% versus 23%).